On August 4, the Human Rights Center Fray Bartolome de Las Casas (CDHFBC) reported that 32 people from the community Egipto, belonging to the Caracol of La Garrucha, were forcibly displaced due to the aggressions of members of Ejido Pojcol, Chilón municipality. Members of the community Egipto, from the Rebel Zapatista Autonomous Municipality (MAREZ) San Manuel, in the official municipality of Ocosingo, reported to the CDHFBC that the incident occurred on August 1st, at 23:30 hours. They said that a group of armed people from Ejido Pojcol entered the land where members of the community Ejido were realizing collective work. They reported that those armed people killed a young bull and that they fired gunshots in the air. 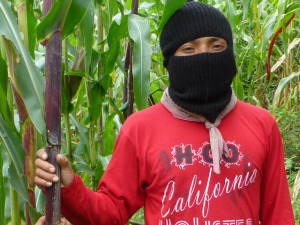 The CDHFBC stressed that these events occured in the context of the First Exchanges between the Zapatista Peoples and the Native Peoples of Mexico “Compañero David Ruiz Garcia”, a meeting of the National Indigenous Congress (CNI), which began on August 4, in the Autonomous Community of La Realidad. This entry was posted on Friday, August 29th, 2014 at 11:09 am and is filed under Chiapas, EZLN, Human Rights, Indigenous people, Land and Territory. You can follow any responses to this entry through the RSS 2.0 feed. You can leave a response, or trackback from your own site.